Video projectors are an ideal entertainment gadget for any family or, better yet, for young millennials trying to save money and still stoked about spending some quality time at the comfort of their residence. So here it is, the information you’ll need to choose the best outdoor projectors for your backyard home theater. You simply place one of these projectors at about the ceiling height in your backyard, aim it at a tall flat wall or a fence, and enjoy quality movie time at the comfort of your own property. On this list, you’ll find our selection of outdoor projectors which are portable, projector screens, as well as outdoor speakers to go with them. Why you should buy an outdoor movie projector? A big modern TV in excess of 75 inches is way more expensive than a portable projector that can project 300 inches of display. More so, with a projector, you can host games out-in-the-open just with few cables. Additionally, outdoor projectors and outdoor speakers resist the elements and can deliver awesome quality entertainment even under the rain. The largest possible picture: screen projectors deliver the largest image sizes you can find, as much as 300”. Flat screen TVs, by comparison, reach between 32” to 100”, with bigger sized TVs more exorbitant in price. You can’t afford a TV: modern TVs are very rude to your wallet as a decent sized one easily costs above $1000, whereas projector prices are declining each year. You don’t have space for a TV: TVs are large, bulky, and often require furniture. A small projector can sit on a coffee table or in a bracket on a roof, while still projecting, as we mentioned, the largest image you can find. When you’re not using it, you can tuck it in your closet and maybe just dust it out for special events for watching movies in your backyard. You can carry your movies and games with you: screen projectors are often portable and ready to install anywhere and anytime. Especially, new LED projectors can fit in your pocket. Immersive 3D experience: some projectors have 3D capabilities. 3D projection gives a wider viewing angle that optimizes user experience. 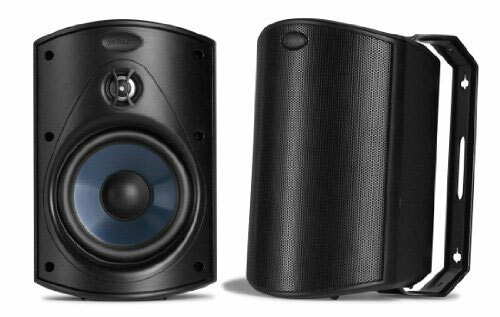 If all of this arguments are not engaging enough for you, consider this: after reading this article you’ll get to know everything you need as well as the best outdoor speakers so you can immerse yourself in a whole 5.1 Dolby surround sound experience. Projector features can intimidate any novice customers. So here we’ve created a list where we convey in simple terms about things pertaining to projectors so you can make a well informed decision. We can help you make an informed decision, but only if you keep reading, okay? Have you ever seen things like lumens, contrast ratio, aspect ratio, etc.? Do you know what it means? Probably not, as they all sound like Greek words coming straight out a Socrates’ speech. Three projector types are : LCD, DLP, LCoS. DLP: DLP projectors have deeper and better blacks than their LCD competitors, as well as high color contrast and increased pixel density. However, these are easily affected by the rainbow effect. LCD: LCD projectors are more energy efficient and brighter than their competitors. Also, LCD video projectors are rarely affected by the rainbow effect. LCoS: these screens use a liquid crystal layer on top of a silicon backplane. They are common in movie theaters as their quality is far superior. However, prices are also higher, thus LCoS screens are not highly featured on our list. You will also find LED projectors in the market. 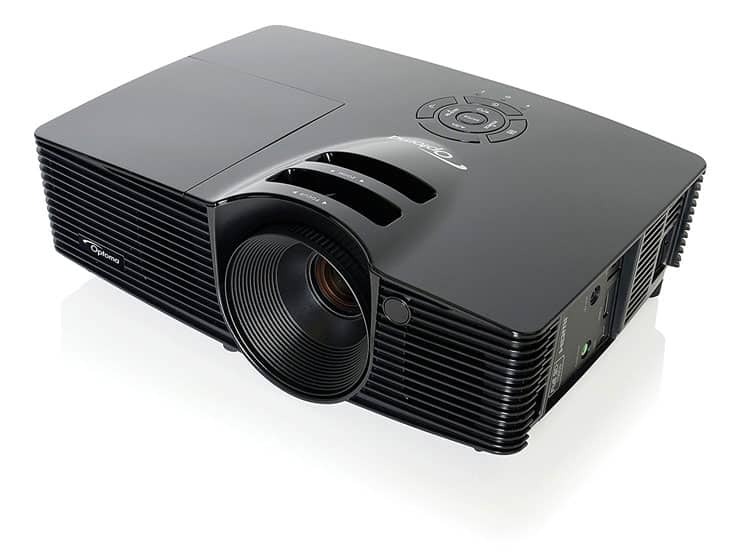 Newer projectors are available with LED light source instead of a traditional halogen lamp. The advantages of LED light source over a traditional halogen lamp are the long lamp life (around 10x more), low heat dissipation, high energy efficiency, and small size. Rainbow effect is a visual effect/distortion found on single-chip DLP projectors. Because these machines create their images through a fast cycle of blue, red, and green colors, sometimes a “rainbow” leaks behind dark backgrounds of bright images during a fast sequence. Lumens is the brightness rating of projectors. It’s a rather simple spec: the higher the number, the brighter the screen. How many lumens do viewers need to comfortably watch a movie with a projector? Well, it depends on the place where they’re planning on placing the projector, the size of the room, and the number of people watching. As a general rule of thumb, home theaters should have between 2,000 to 2,500 lumens, which is excellent for both indoor and outdoor spaces and for groups of up to 10 people. A home theater’s width and height ratio are usually one of the three. 16:9 ratio (standard HDTV): produces images in a rectangular size. It’s the most common ratio found in mainstream multimedia like movies, series, and YouTube. It’s the standard 1080p definition, which is 1920 pixels width by 1080 pixels height. 4:3 ratio: (XGA & SXGA): it’s an image that’s more squared, similar to the Instagram videos that cover the whole screen vertically, as well as media found in other social networks. It’s also the common aspect ratio for business and academic presentations. 16:10 (WXGA & WUXGA): a slightly different version of the HDTV aspect ratio. It’s the common display of tablets and computers, so it works if you’re planning to cast your computer’s screen with a projector. 16:9 is the standard aspect ratio for HDTV signals like Blu-ray discs and DVD, which is why most home theater projectors support this aspect ratio. The contrast ratio is the brightness difference between white and black images. A 10,000:1 ratio means white images are 10,000 times birther than black ones. This particular spec doesn’t make much of a difference in outdoor projectors. Lamp life is the expected life-span of projector screens. It’s expressed in the number of hours, and numbers go well beyond 1,000 hours. If you’re using your projector at normal rates (let’s say, five hours per day in a non-threatening environment), your projector will last as much as it says it will. However, if you’re pushing it too hard, the lamp lights are going to wither and die sooner than expected. For example, using a projector 24 hours a day will make the lamp fail in less than a week. Keep that in mind: a projector is not a TV, and you should use it only on special occasions. You know…projector & chill…right? As the light dies, you would notice a gradual dimming of the image. When this happens, it means it’s time to change the lamp lights. As mentioned above, newer projectors are available with LED light source instead of a traditional halogen lamp. The advantages of LED light source over a traditional halogen lamp are the long lamp life (around 10x more), low heat dissipation, high energy efficiency, and small size. How to know which are the best outdoor projectors? Picture and video quality: we checked how good these video projectors are compared to their price. We juggled resolution, screen brightness, contrast, and sound quality within a minimal budget range. Some projectors have 3D capabilities, whereas others allow connecting SD cards and mobile devices. All of the models have HDMI ports which can accept the highest quality video from an input source. 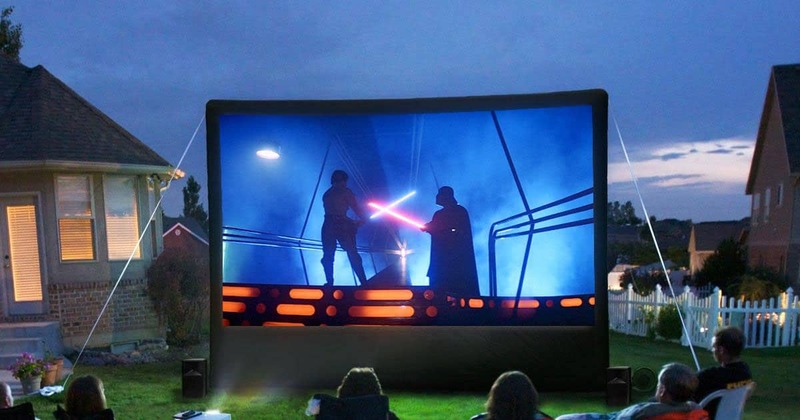 Best value for your buck: outdoor projectors are already costly, so we’re not trying to empty your bank account. Instead, we’re looking for maximum features for the less money! Resolution is the main attractive quality, while other features like wireless connection, built-in speakers, or dynamic iris come afterward. Features: best backyard screen projectors have plenty of image options, as well as preset viewings and all of those juicy HMDI ports. We took into consideration the most useful perks like built-in Blue Ray and DVD player, lens shift, and integrated speakers. Overall, you would be looking for projectors that serve as home theaters. So search for big-screens, vibrant colors, high color saturation, robust contrast (above 10,000:1), 3D capabilities, and great picture quality. Out of these specs, we’ve built our top 5 lists of the best outdoor projectors for 2019. Optoma is a trusted manufacturer of projector screens, and their projectors never fail to satisfy consumers. The HD143X version has a 1080p resolution and two HDMI ports, which allow you to connect two different sources at the same time, while, of course, playing only one at a time. More so, it has an MHL port to connect smartphones and tablets. 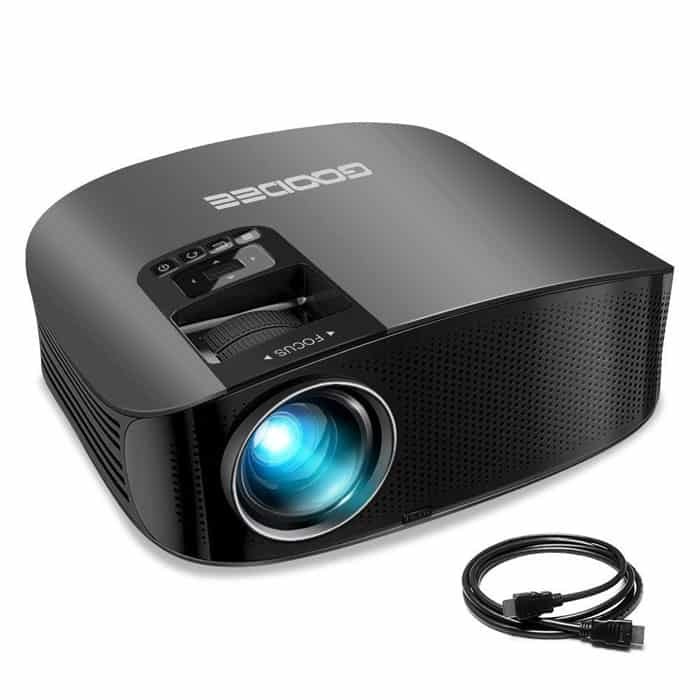 It supports 3D Blu-ray for an amazing image quality, and it has a modest 10W built-in speaker that seals the deal for a reasonable-priced screen projector. If not, it has a 3.5mm audio jack, so if you already own speakers, just plug it in with a common auxiliary cable. The Optoma HD143X screen projector weights but 5.5 pounds and measures 4” X 8.8” X 12.4”. It’s sleek and light design makes it easy to install on a ceiling. 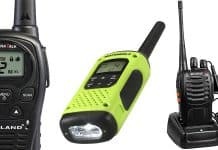 It has a lit remote control that’s easy to use in dark ambiances. Also, for your convenience, it’s easy to find (because it has a backlight). Display is clear if you don’t go beyond 20 feet away, while the Dynamic Black increases contrast by dimming the lights. Aside from its ports, it supports streaming devices like Roku or Chromecast. It means you can watch your favorite content from Netflix. Or, Hulu, Amazon Prime, HBO GO, whatever rocks your boat. For ·3D viewing, it features Vesa ·D sync support to connect an external RF 3D emitter. And lastly, it has a gaming mode which makes the image faster to keep you ahead of enemies. Performance of the Optoma HD143X is above average for a projector below $500. The image and sound quality are more than okay, while 3D projection is effortless and clean. 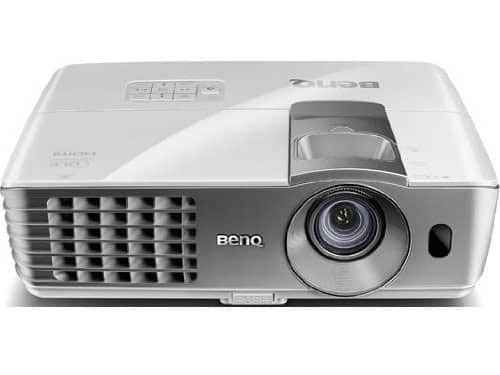 BenQ W1070 DLP HD 1080p outdoor screen projector has an amazing picture quality, and most people buy it because of its 1080p resolution from up to 16 ft. of distance. However, the investment on Full HD means fewer features, and if you’re okay with that, the BenQ model can add a lot of value to your life, also for less than $500. Its most attractive feature is its built-in 10W speakers, which only need a power cord and a video source connection. So you plug, play, and projector & chill. Also, its SmartEco Technology saves up to 70% energy; a convenient feature that will help you keep your bills lighter. Well, I mean, darker. 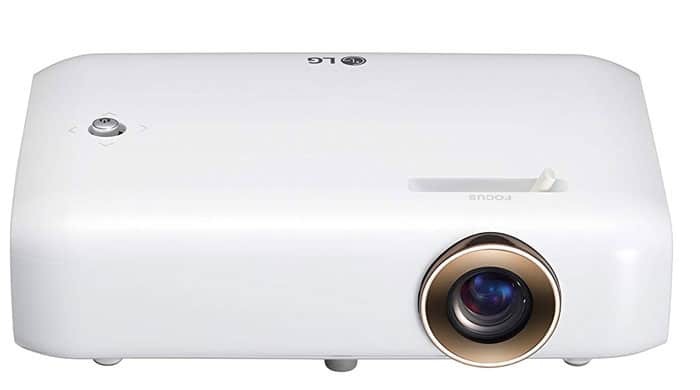 BenQ W1070 projector has a white exterior and a silver-branded logo on the side that suits office decorations. It’s also very portable with its 12.3” x 9.6” x 4.1”. Within its body, it has a manual zoom (allowing a 1.3 zoom) and a focus hide that could be difficult to operate with your hands. It has the option of vertical lens shift, which most projectors on this budget do not have. That means you could move the lens up, down, left or right to project the image wherever you’d like. Additionally, it boasts two HDMI ports, a component video, composite, S-video, and audio in/out. It supports 3D Blu-ray video, 3D broadcasting, video games, and connectivity to NVIDIA 3DTV PC. The image quality of the BenQ W1070 outdoor movie screen will surely catch your eyes. 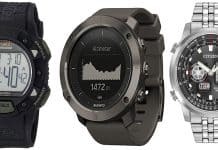 Images pop out, and the SmartEco mode delivers an efficient service. When this mode is on, shadow detail, colors, and tones are much better. Even with its low number of lumens (and we know it falls below what we recommended), the device does well in both daylight and nighttime. And as for games, there are no lag issues, so you could definitely enjoy some online playing with the BenQ projector. Movement is smooth enough, so your fun time will depend entirely on the game you choose to play…choose wisely. Manual focus and focus hide are hard to operate. So hard you’ll forget about these options. 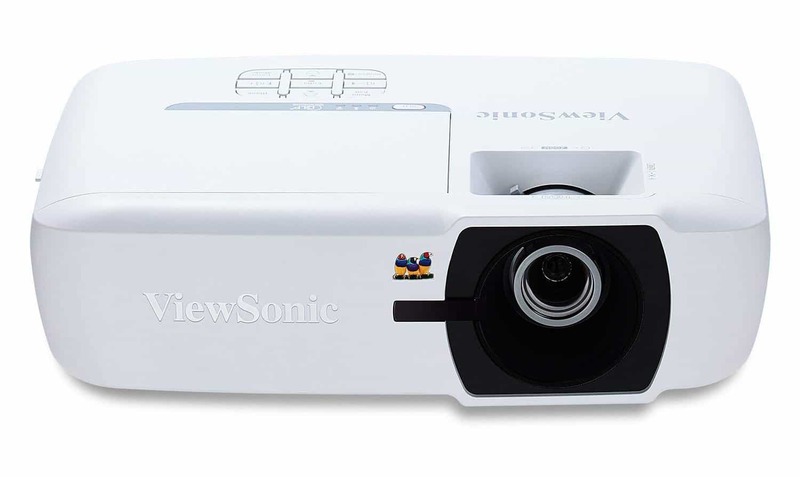 The ViewSonic PJD555W WXGA projector fits small budget range and delivers great results. With its decent amount of features and inputs, it can work in both indoor and outdoor settings. More so, its advanced visual features make it a great choice for educational and business purposes. The ViewSonic outdoor projector is a big screen that features 120” from 12 ft. And since you’re looking for a home theater, this 3D capable model is right for you. This particular projector is highly portable as it weighs about 4.6 pounds and measures 12.44” x 9” x 4”. In addition to its slim design, it has a cable management hood that hides all those ugly wires at the projector’s back. Also, you can do the lamp maintenance via a hatch at the top of the device. The 16:10 resolution means watching movies will happen with a 1280 x 800 resolution. Meanwhile, the 3,500 picture is bright, brighter than the two models above. It’s connectivity features include two HDMI ports, 1 VGA out port, 2 VGA in ports, S Video, audio in/out, and RCA Composite video. The HDMI allows watching 3D movies with either a PC or a 3D Blu-Ray. Other options include a 1.1 zoom ring and a focus wheel. Also, it has 5 images presets and a Dynamic Eco mode that extends life up to 10,000 hours. ViewSonic PJD555W WXGA movie theater performs well in both ambient light and darkness. The images are clear, although not as crisp as the models mentioned above, while the contrast ratio is just good enough. The colors, while a bit dull, are okay for the price; but the 3D viewing was a complete threat, well above its low price. The GooDee is one of the best 2018 LCD outdoor projectors, and, considering its low, very low price, is definitely the best investment. For below $200, it creates a complete home cinematic experience with its 2,200 lumens providing wider and brighter images suited for dark or outdoor places like a garage or a backyard. The projection size is comfortable and large (22 inches at 18 ft.), while the screen size remains standard 8 x 12 ft. The quality it provides makes it ideal for watching movies: it offers both 16:9 and 16:10 resolutions, which will give you accurate and vivid images for your movies, game, presentations, graphics, and more. One of its better features is its silent fan coupled with built-in 3W HiFi Level Stereo Audio speakers. Such a combo provides superb heat dissipation, lower noise, and okay sound quality. Furthermore, the GooDee has a strong cooling system that keeps heat away and noises level low. The GooDee movie theater has various connections that include HDMI, AV, VGA, SD, Micro SD, USB, and audio in/out. This projector is by far the best one on its price range. For such a low cost, it still offers lens shift to suit different needs and environments while at the same time with clear and crisp image in dark. An ultra-portable and ultra-light projector with 30,000 hours of lamplight, 500 lumens, HD resolution (1280 x 720), and a beautiful display of rich and vivid colors. We picked the Minibean because it has 10 years of lamp life, which means you can use it for 8 hours per day, 7 days per week. Also, it’s a simple design without connection ports on its body, which makes it easy to carry around to plug and play. Also, it has a wireless connectivity, thus it doesn’t need network dongle as you can simply link your smartphone and cast movies, pictures, series, music, or whatever you like. For the audio, you can connect this portable projector with a Blutooth speaker. And here’s our choice to spice up your home theater with some neat sound. We could have gone for any Bose speakers, but that’s the easy choice. I mean, buying expensive things out of a reputable brand will often be a good choice, but as this article is budget friendly, let’s go for Polk Audio Atrium 4. Atrium 4 has an attractive price, a simple mounting setup, an acoustic design, a neat black or white design, and a superb sound quality. Polk backs it up with a 5-year warranty. The Atrium series speakers were the easy choice because they exceed in environmental endurance. With a strong aluminum body and superb dust filters, these outdoor speakers are immune to the elements and offer excellent power handling and smooth responses. An outdoor projector, coupled with powerful speakers, is an easy home cinema. Buying the two can cost less than $600, and you will be able to install these devices in your backyard, garage, living room, or even in your room. Then, you simply connect them with a computer, a memory card, or a mobile device, and enjoy your favorite content on a big screen. Remember not to overuse projectors because you could damage the lamp’s life.